There are at least five big discussions every couple should have before their wedding day. Having these discussions now will help you to determine if you are truly on the same page or if you need to have a longer talk. The idea here is to have those conversations before too much time has passed. There's no point in avoiding them and having them now just might save your marriage further down the line. Being clear of your honest opinions, even hypothetically, on whether or not to try for children (or more children) will help you both to understand the path you are on. There is no point in faking being on the same page if you're not as this will just save up trouble for later. If one partner wants children and the other doesn't then something has to give, and resentment builds if one of the couple feels like they are being denied the opportunity to be a parent. Many couples avoid talking about money despite needing to pay bills, etc. Do you both spend-as-you-earn or is one of you more of a saver? Who pays the bills or do you split them equally? Do you have a long-term plan for your income? Shared ownership of debts and understanding what you both spend money on each month will help you prepare a wedding budget. Longer term, having talked about what is essential spending will stand you in good stead for any future hard times in case of the need for cut backs. What if one of you were offered a job in another town or county or even further away? Would you both be willing or able to move? Does one of you aspire to start or expand your own business? How would this effect your finances/childcare/family and could you cope? Having this discussion before it is needed will help you each understand your work aspirations and priorities and lay important foundations should the topic need further investigation. Planning for the future should also include having wills and pensions in place. Families are complicated, and weddings can bring out the worst, so you need to identify your family dynamics sooner rather than later. How often should your family visit, or you visit your family, or theirs? You need to understand how your partner prioritizes their family and yours, and how you share those important dates throughout the year. Again, knowing in advance what each other's priorities are will help you to understand each request as it comes and plan your wedding more easily if you don't have to divide everyone up. If you're already living together you'll be starting to get an idea of those little tics and traits. OH isn't it cute how he leaves the top off the toothpaste, the toilet lid up, the cupboard doors open, clothes on the bathroom floor... now imagine you in 10, 20 years...! A short blameless conversation now about how you'd 'really like it if' could save a lifetime of 'but you always/never' type arguments. It's also important to remember that many of those habits are trivial - does it really matter that you want the loo seat down and he wants it up, in the grand scheme of things it's not a matter of life and death! The first year of marriage can be tough for some couples, after all the hubbub of planning the wedding has died down and the 'Thank You' cards have been sent, it can feel like a bit of a hole has been left in your life. That can be when the little niggles can set in. 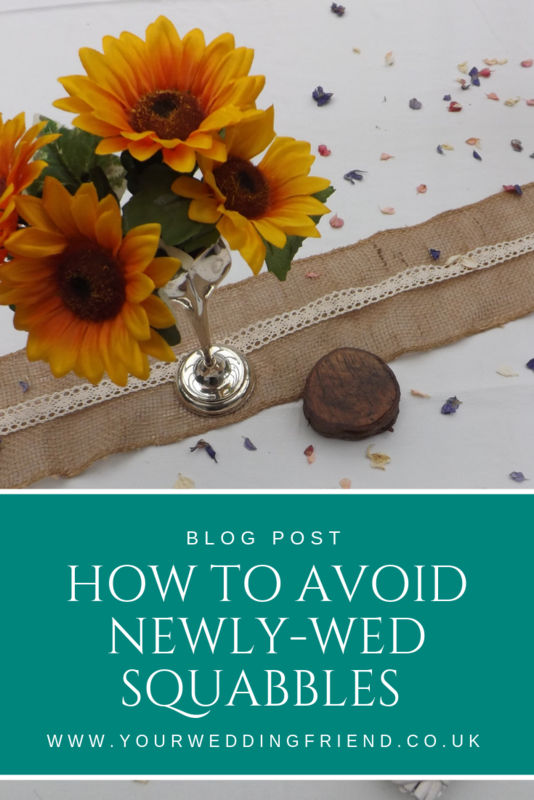 Using the time in the early stages of planning your wedding, just post engagement, to iron out the tricky stuff can make the idle moments post wedding that bit easier. These are by no means the only conversations you should be having before you get married but you get the idea. If there is something you're putting off talking about, you need to get it out in the open before it festers, or gets to be too late. Remember it's about having a conversation NOT starting an argument. It's okay to disagree but the fundamental thing is that you reach an understanding or a compromise if necessary.